Now that I’m coming close to the end of my pregnancy I can look back at all of the foods I can’t seem to live without and have had endless cravings for on a daily basis. For the most part just keeping up with two kids and life it’s been about planning ahead as much as possible to get as many nutrients in my body as possible. If baby #3 has wanted anything, though, it’s a lot of salmon! I assume it’s all of the omega 3 fatty acids my body has been requiring which is essential as they’re a building block for babies brains. To mix it up every week I’ve made Maple Soy Salmon, Simple Breakfast Flat Bread with smoked salmon, even Salmon Burgers, but when I want to make a simple piece of broiled salmon I want it on top of a ton of nutritious veggies, served with nuts or seeds for crunch and drizzled with a squeeze of lemon juice and olive oil to let the natural flavors shine through, this is my go-to dish. Watch this Superfood Salad Video to see which vegetables make it so nutritious and irresistible when you’re trying to pack as much health into your body as possible. If you’ve heard the catch phrase, but still aren’t exactly sure what superfoods really mean, they are nutrient-rich foods considered to be especially beneficial for health and well-being. 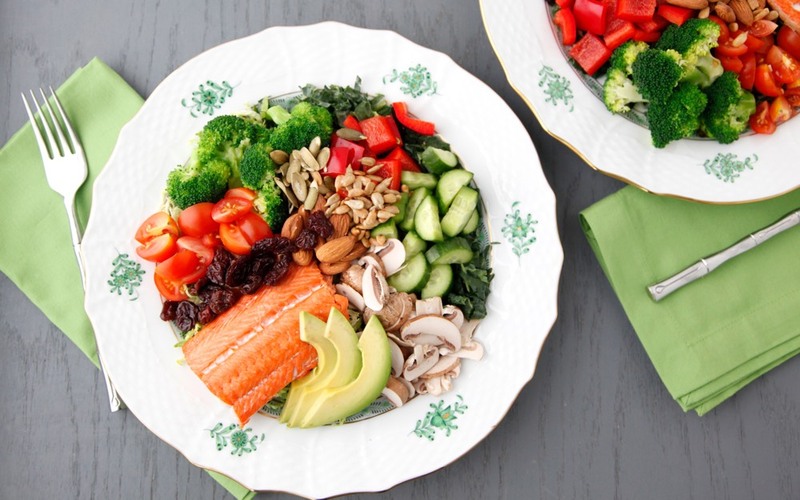 When you’re pregnant or even just trying to focus on your body performing at it’s optimal health, Superfood Salad is a great way to give your body a boost and fulfill a bunch of cravings! Thank you for the superfood salad recipe! I can't wait to make it for my family. I really love Weelicious tips on feeding my family new and delicious meals. One suggestion - I love Weelicious but watching the salad being prepared with black nail polish on your nails is distracting and kind of yucky. Not very food friendly. A pretty and neutral color would be way more appealing in future videos. Thanks!